Few films have made me go to the cinema again to rewatch them. I did it with The Dark Knight Rises, The Hangover, The Departed and other movies that begin with “the”. But so far, none of them had been a Spanish one. I am a detractor of Spanish cinema, as controversial as that might sound. It lacks strength and quality, which means that the only successful Spanish movies are comedies, even if they are crude and vulgar. But that is not the case with Ocho Apellidos Vascos (Eight Basque Surnames), which has become an record-breaking success in the country. The biggest appeal of the film is that it hits close to home. Everybody can relate to either the southerners or the northerners of the story, and laugh at the cultural differences that every Spaniard has experienced in real life. It shows more the South’s perspective of what northerners are like, but it also sends a message of unity. Because the story of this film could happen to anyone: Basque girl Amaia travels to Seville with her friends after being left by her fiance weeks before her wedding. There, she sees a guy, Rafa, making jokes about the Basque Country (as it happens). After fighting and sort of making out, he falls in love with Amaia and follows her to her hometown to return the purse she forgot at his house. The problem begins when her father shows up expecting a wedding and Rafa has to pretend he is Amaia’s fiance, a true local with his eight Basque surnames and everything that it entails, from clothes to customs and accent. And that is what has made this movie so successful. 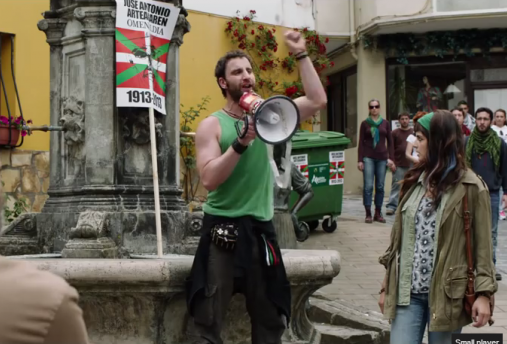 I don’t know if the movie will be released in the UK (I have already seen posters where the movie is translated as Spanish Affair), but if it is, most of the jokes will be lost out of their culture, especially when the main character makes up his eight Basque surnames, which he borrows from all the famous Basque people he can think of. Still, it is an unmissable film, in the style of the French Bienvenue chez les Ch’tis -which I just found out it was called Welcome to the Sticks in English, why? Seriously, if someone could explain this to me, I would like to know if it has a special meaning. Bottom line: go and see this movie if you can. It stars the now megastar comedian Dani Rovira and Clara Lago as the main couple, TV star Carmen Machi as Rafa’s fake mother and Karra Elejalde as Amaia’s closed-minded Basque father.